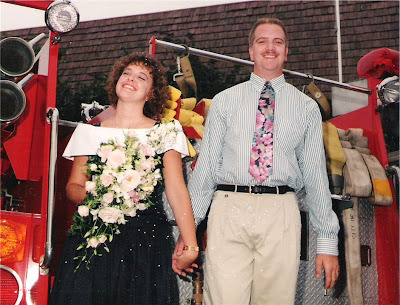 We were young and in love... excited about a wedding I had dreamed about... and maybe blind to what marriage was all about. But in we jumped with blind faith and commitment- and here we are, sixteen years later... thankful for all we have learned and thankful for each other- and for God. He has blessed us with his love, He has given us strength when we fell short, He has reminded us time and again that the love we share can overcome so much, and He has held our hands through the ups and downs of life that can be so incredible, and so disheartening. As we spoke our vows, I felt as if we belonged to another time, another place in the world... The old language spoke to our hearts and bound us together with lost generations. There are milestone years in marriage- one, five, ten, and so on... those numbers have not meant as much to us, as we were separated on a lot of those anniversaries. One... he was out to sea; We celebrated our second together as our first. Ten... he was in Guantanamo; We celebrated eleven at a marriage conference. It was maybe the biggest milestone for me- knowing that we had been married for longer than my parents had been married. It just felt... big. And almost sad. And very important. We usually don't even celebrate our anniversary on the 15th... we have learned to make the most of each other every day. We have learned that the actual day is not as important as the life that happens around the date.